Is your child fond of art and crafts? Is coloring one of his most favorite hobbies? If you said yes, here are some coloring sheets to help fuel his interest. “101 Dalmatians” is one of the most favorite kids’ movies of all time. It is a part of the Disney Franchise. The story is about a dog family that lost its puppies to a cruel lady, Cruella de Villa. Cruella wants to use the skin of the puppies for her clothing. What follows is a series of adventures. 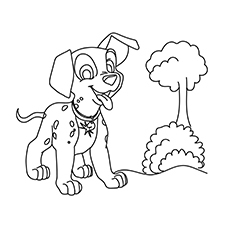 Check out our collection of 101 Dalmatians coloring pages below. 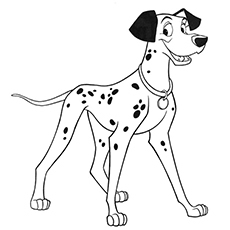 Pongo is the pet of Roger Radcliffe in the book and television series. He is famous for his solid black ears and the red collar. Pongo is very intelligent. People always come to him looking for advice and suggestions. In fact, Pongo has the brightest minds in the dogdom. 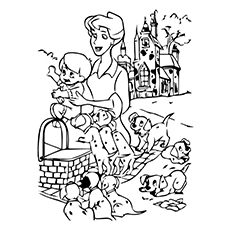 This is one of the interesting 101 dalmatians coloring sheets showing Pertida looking after her pups. Perdita is Pongo’s mate. She is well-mannered, elegant and beautiful, in short, a complete foil to Pongo’s laid-back nature. 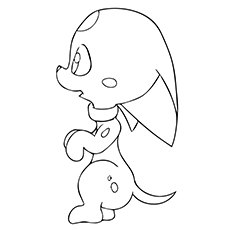 Despite her calm and quiet nature, Perdita becomes incredibly worried in hectic situations. She is also a fierce fighter, as seen in her battle with Horace and Jasper. She has a pair of spotted ears and always wears a blue collar. Cruella is the main antagonist in the “101 Dalmatians” franchise. She is the neighbor of Roger and Anita Radcliffe. Cruella is the head of House of De Vil, a fashion store where Anita works. She is a greedy woman. She also tries to steal Dearly’s Farm to get richer. 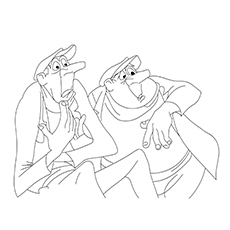 Horace and Jasper are the two clumsy helpers of Cruella. She hired them to kidnap the puppies of Perdita and Pongo. While both are dumb, Horace seems a bit wiser as he comes up with better ideas. But Cruella rejects all his ideas in favor of Jasper’s ideas. Roger is the owner of Pongo and lives in a small bachelor flat. As a songwriter, Roger is very creative and can easily write the lyrics when given a proper muse or inspiration. Even though he is an artist, Roger is brave enough to stand up for himself and his family against Cruella. Anita is the owner of Perdita and a worker at Cruella’s De Vil. Anita was also the childhood friend of Cruella, but their friendship ends when Cruella offers to buy all the fifteen puppies of Perdita and Pongo. Anita and Roger then fall in love later in the film and end up as husband and wife. Patch is a large pup in Perdita and Pongo’s litter. 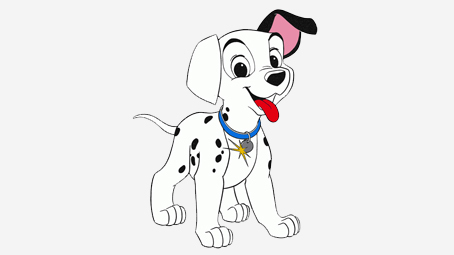 Patch was born with a black mark around his eye, which was unusual since most of the Dalmatians are born pure white. 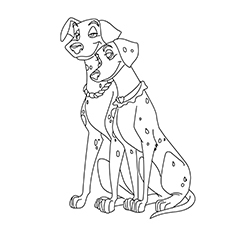 Patch was the one who informed Pongo and Perdita about the pups in the Hell Hall and what Cruella plans to do with them. Lucky is the ringleader of his brothers and sisters. He is an energetic puppy and actively takes part in the escape as the leader of the puppies. He is also a quick thinking puppy and is fast in getting out of trouble. Lucky has black spots that form the shape of an inverted horseshoe. Rolly, also called Roly-Poly, is a mischievous and playful puppy who always gets into trouble. Rolly has an enormous appetite. You will always see him munching something or the other throughout the film. You can recognize Rolly from the spots on his ears. 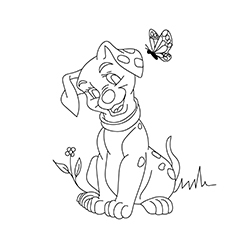 Here is one of the best 101 Dalmation coloring pages, featuring one of the main characters in the film Cadpig. She is the smallest of all the puppies and shares a special bond with Patch. She is a fragile puppy. She cannot walk long distances and gets tired quickly. She is into the New Age Philosophies and tries her best to promote goodwill throughout the world. 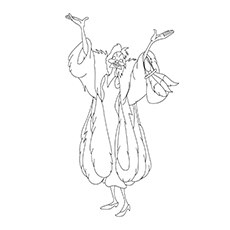 These free printable 101 101 Dalmatians coloring pages online will help your child relive the thrill of the movie. If you want to print the diagrams, click on the image and then save. 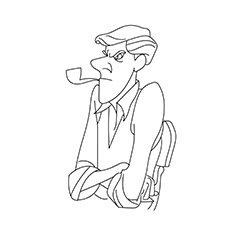 Make sure you print 101 Dalmatians coloring pictures on heavyweight paper for best results. 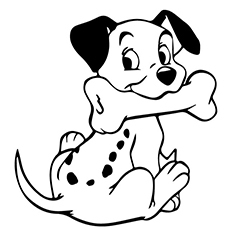 Who is your child’s favorite pup in the film “101 Dalmatians”? Tell us about it here.